AMROTEC X-1 - Technology Unlimited, Inc.Technology Unlimited, Inc. This X-1 Counter from Amrotec is an excellent currency discriminator – one of the world’s most compact and low-priced advanced Currency Discriminator with a dedicated Reject Pocket. Yes it reads the bills while counting. 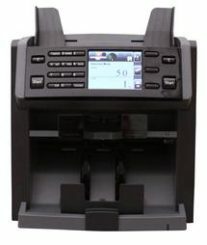 It is equipped with the most comprehensive, user-friendly functions necessary for Single or even DUAL tellers (Dual User’s Function available)) and cashiers in low to medium cash handling environment. With an ergonomic design, color TFT Color display and user-friendly interface, the X-1 not only provides operators with trouble-free operation and an efficient working environment, but, also allows uninterrupted counting experience with dedicated reject pocket. X-1, further provides exacting security standards against the latest counterfeiting attempts through multi-detection technology, while still maintaining a low false alarm level and an excellent acceptance rate. Call us for a great price for this unit and an ongoing service contract.